THE REVIEW: The extent of my knowledge on Scientology before watching Going Clear was that Tom Cruise belonged to the Church and that many people label the “religion” as a cult. What this documentary does extremely well is paint a very clear picture, using stories from ex-members and former leaders high up in the organization’s food chain, of how restricting and limiting Scientology is. It is hard to think after watching this documentary that Scientology is anything but a cult which brainwashes and uses its members for the good of its executives; primarily the founder L. Ron Hubbard, and since his passing, Chairman of the Board David Miscavige. As Lawrence Wright — author of the non-fiction book on which this documentary is based — points out, he did not set out to write an exposé on Scientology. He merely wanted to better understand the workings of the religion and why people choose to practice this particular faith. For people as unaware as I was, Going Clear also does a great job at explaining the foundations of Scientology, how it was created, and how it claims to “help” its members. Obviously, by the end of the film, it is hard to see Scientology as anything but a manipulative, coercive, cash-grab, but director Alex Gibney at least tries to entertain the notion of objectivism. 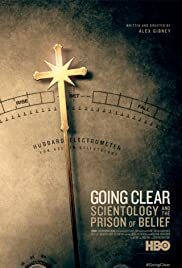 While Going Clear does a great job at highlighting certain portions of the Scientology practice — mainly the deception, extortion, and what could only be described as slavery — I would have also liked to see a different portion explained or highlighted: daily life. There are brief allusions to this when they explain how John Travolta first joined the Church. Once he joined, it seemed like every audition he went on he booked the part, therefore improving his daily life. But other than that, we never really get a good idea at a “normal” (i.e. a non-celebrity) member of the Church and what their lives are like outside of the Church. This would detract from the main focus of this documentary, but I feel like seeing a daily routine so-to-speak could help emphasize just how damaging Scientology can be and the impacts it has on people.